Place des Terreaux was once a huge bog, believe it or not. Today, the famous Lyonnais landmark deserves a visit, either as a starting point to explore the presqu’île and the City Hall area, or as a beautifully-constructed square to while away the hours. 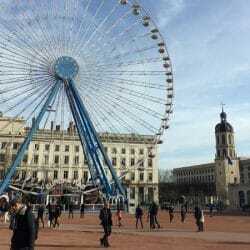 Place des Terreaux is a famous Lyonnais square, grand and grey. 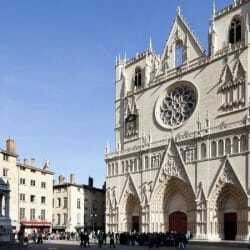 It’s a perfect rectangle in fact, located in the 1st district of Lyon inside the peninsular or ‘presqu’île’ between the Rhône and Saône rivers, at the foot of the Croix-Rousse hill. 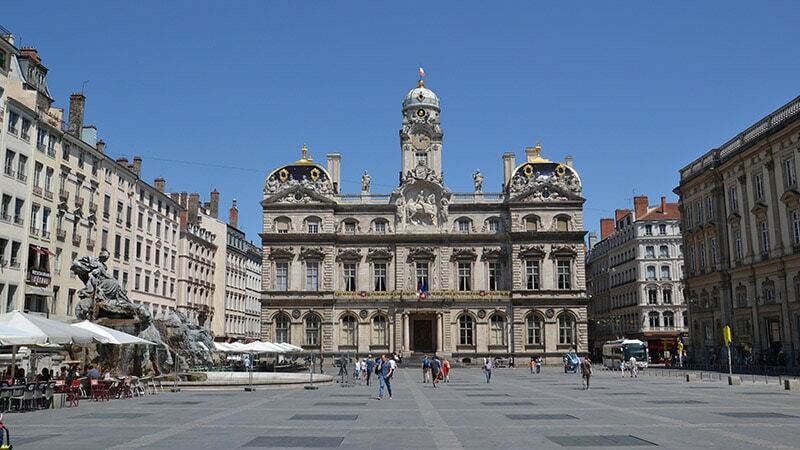 It’s a Lyon landmark and a UNESCO heritage site, the place to meet, inside which you can sip beer in the outdoor cafés, perch on the steps of the Fine Arts Museum and observe the Bartholdi fountain, or pop into the beautiful City Hall to pay new mayor Mr Képénikian a visit. Place des Terreaux and Hôtel de Ville of Lyon, France. 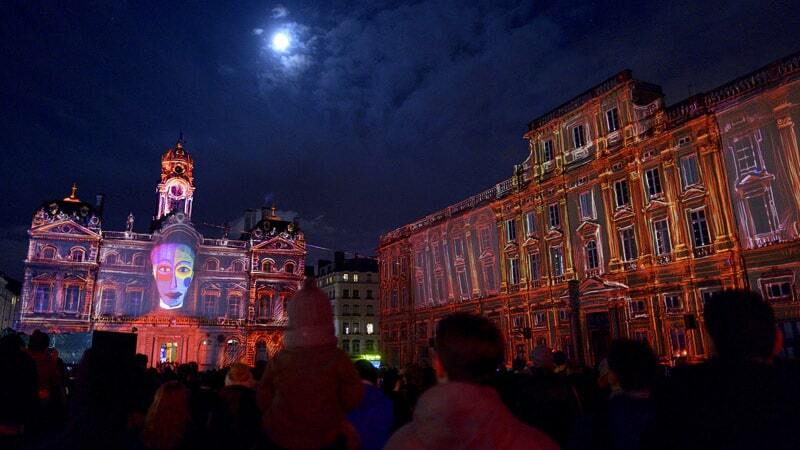 Come Lyon’s Festival of Lights (8th December) the square is alive with stories of all sorts projected onto its rather splendid buildings. 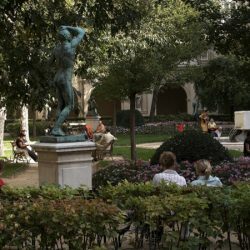 To the east you have the City Hall, a classical architectural gem from the 17th century, sumptuous and ornate, to the south Saint-Pierre Palace and the Fine Arts Museum, the west houses a gallery through buildings and the north marks the beginning of the Croix Rousse slopes. If you go beyond the Hotel de Ville, you are slapped in the face by the Opera behind. Magnifique. The Terreaux square you see today was redeveloped by architect and urban planner Christian Drevet and artist Danile Buren in 1994. They’re the ones who brought the sporadically-functioning jets of water, 69 of them, accompanied by 14 pillars, much to the raised eyebrows of the Lyonnais. But it didn’t always look like this. Oh no, far from it. Back in the 13th century, there was a lot of bickering going on between ecclesiastic powers and the Lyon bourgeois regarding tax on goods, so the latter came up with the revolutionary idea, ahem, of building a wall. They not only wanted to become more independent regarding their businesses, but their quest was to own their houses. Renaud de Forez II, their main opponent, protested and fought back in 1208, only to be coaxed by Pope Innocent III to calm down, this was the way of progress. As historical oddity would have it, the same Renaud who had opposed the wall took up the idea again and started building. His new-found aim was to protect the city from an attack from les Dombes. It was huge, some 500 metres in length, 10 metres high and 2 metres thick. It went from the foot of Saint Sébastien hill, had 10 towers, drawbridges and a huge pit that could be filled with water in the event of an attack (more in a bit). The main tower was on the Saône river to control the Exchange Bridge – the only passage between St Nizier and St Jean. Back to the pit. In Latin, this pit was called Terralia Nova (‘new pit of earth and water’) or Fossés de la Lanterne, and this is what the Square was – a huge mud-filled ditch used by crossbowmen as a training location, but also as a trap from naughty invaders from the north. In the 16th century, the wall was in ruin and in 1538 it was demolished. 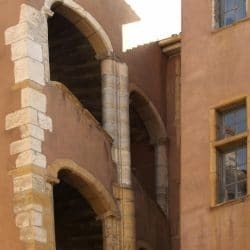 The pit was filled in and the stones of the wall used by nuns to renovate the St Pierre convent which has housed the Fine Arts Museum since 1803. 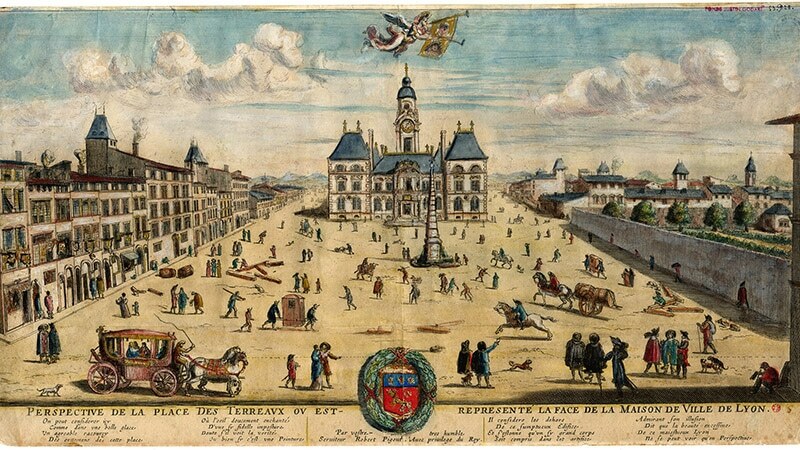 Between 1646 and 1651, Simon Maupin built the Hôtel de Ville de Lyon, which was later rebuilt by a certain Jules Hardouin-Mansart, after a huge fire in 1674. Access to the square was then further developed in the 19th century. It wasn’t all peace and nuns though. A string of people were beheaded on Place des Terreaux: Henri Coiffier de Ruzé, Marquis of Cinq-Mars, being one of them, a conspirator against Richelieu. During the French Revolution, the guillotine was brought in and worked a treat during the tenure of Marie Joseph Chalier. And after the siege of Lyon, a whopping 79 people were beheaded. Then came the fountain, another heritage monument, which was never actually destined for Lyon. It was meant for Bordeaux. Bartholdi was surfing on his acclaim as sculptor of the Statue of Liberty and the Mayor of Bordeaux wanted some sparkle brought to his city. 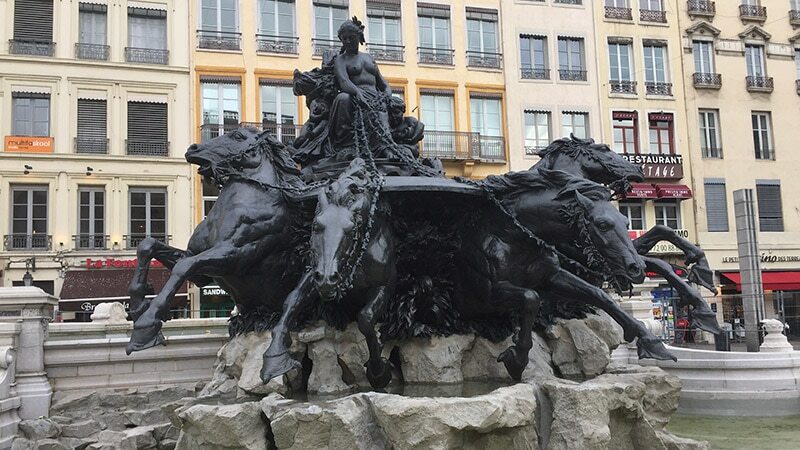 So the two got talking and Bartholdi came up with a stunning fountain named Char Triomphant de la Garonne where France is represented as a female at the helm of a chariot controlling four wild horses – the four great tributaries of the Garonne river – as they lurch into the ocean. But the city of Bordeaux was stripped for cash. 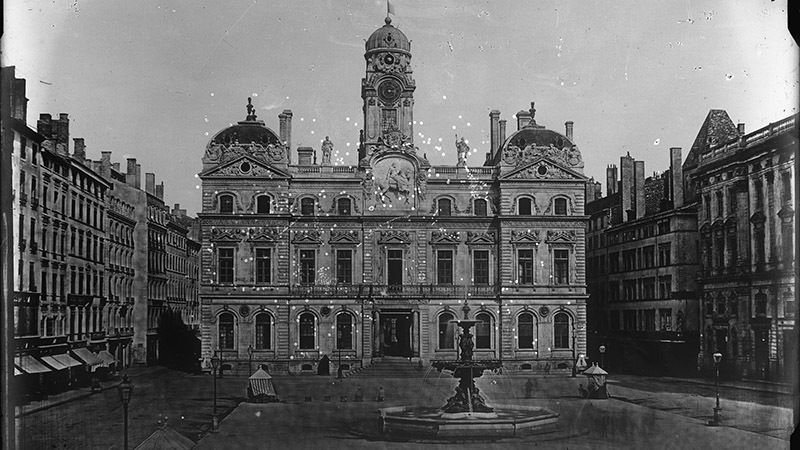 So Lyon’s mayor Antoine Gailleton bought it and it has sat in Place des Terreaux since September 1892. It 2015, however, it was temporarily removed for restoration, but now it’s back and water flows when it wants to. The City Hall of Lyon can be visited only once a year during the European Heritage Days in mid-September. Trip into one of the rowdy pubs on rue St Catherine just behind the square. You’re sure to meet a character or two. If you fancy watching an independent film, either French or from further afield, go sit in the comfy red seats of Cinema Opera, right next to Place des Terreaux. So cosy, edgy and atmospheric.